The chances of seeing a production of Fulgens and Lucres (1497) by Henry Medwall (c. 1462-1502) in any English-speaking country are next to zero. Little enough attention is paid to Shakespeare’s contemporaries and virtually none to his predecessors. Luckily, the University of Toronto is home to a theatre company called the Poculi Ludique Societas (“The Cup and Game Society”), one of the few university companies devoted to producing theatre from the middle ages up to the closing of the theatres in England in 1642. This year the PLS, as it is known, is celebrating its 50th anniversary. To kick off the celebrations it is presenting Fulgens and Lucres, a play written 67 years before Shakespeare was born, that it has not mounted since 1973. The cast of performers with an active background in theatre show off this play in the best possible light. While it is a text that can seem rather unengaging on the page, the new PLS production directed by Matthew Milo Sergi brings it so much to life that it should appeal even to those outside of academe. Fulgens and Lucres (aka Fulgens and Lucrece) is extremely important in the history of English drama for two reasons. First, it is the earliest surviving example of a completely secular play. English drama began with the medieval mystery plays based on stories from the Bible and continued into the 16th century with morality plays, often with religious themes and allegorical characters, such as Everyman, first performed c. 1510. One could easily give the characters of Fulgens and Lucres allegorical names, but the significant point is that Medwall not only chose not to do so, but emphasizes that the action is set in ancient Rome. 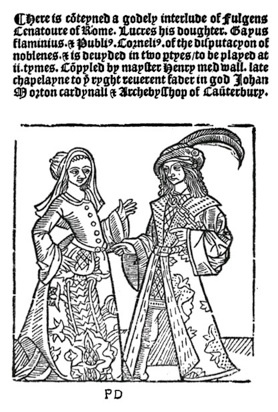 Second, Fulgens and Lucres is the first extant play in English with a subplot, a characteristic that would distinguish English drama from its continental counterparts into the 17th century. In this case the story of the servants provides a comic mirror of that of their masters and actually takes more stage time than the main plot. The play may be set in ancient Rome but it is not based on history. Instead, Medwall was dramatizing an English translation of the humanist treatise in dialogue form De Vera Nobilitate (On True Nobility) from 1438 by Buonaccorso da Montemagno. The treatise makes the radical claim that true nobility does not lie in illustrious descent but in a person’s character and career. From his source Medwall takes the story of the Roman senator Fulgens, whose only daughter is being courted both by the nobleman Publius Cornelius and by the plebeian Gaius Flaminius. Lucres asks her father for advice. In the source the father has the two suitors plead their case before the senate. Medwall has the two plead their case directly to Lucres. While the source does not reveal the senate’s decision, Medwall does reveal Lucres’s. To this main plot Medwall adds his own comic subplot about Cornelius’ servant “A” and Gaius’ servant “B”, who are both in love with Lucres’s maid Joan. They tell Joan to decide between them and she sets them to various physical contests, in contrast to the oratorical contest between Cornelius and Gaius. Medwall was chaplain to John Morton, Cardinal and Archbishop of Canterbury. It is presumed that Fulgens and Lucres was first performed at a banquet held by Morton for two foreign ambassadors. The play has no fourth wall since A and B speak directly to the audience. We first assume that the two will be comic commentators on the action since they both speak of their anticipation of seeing a play. But soon enough they become involved in the action when they hear that Cornelius and Gaius are both in need of servants. Medwall’s dramatization of the audience’s psychological involvement by showing it physically being drawn into the action of a play thus predates by 110 years Francis Beaumont’s The Knight of the Burning Pestle (1607), the most famous example of this in English. who fumbles in trying to read B’s lines from the script, Filippov whips off her modern dress to turn into B herself. Drawing on moustaches in lipstick to suggest the male actors who would likely have played these roles, A and B, hearing that Gaius and Cornelius are in need of servants, go off to present their services to them. Throughout the act action A and B function as a bridge between the audience and the play. Most of their commentary is spoken directly to the audience. When not acting, A and B chat and flirt with the crowd. Sergi takes this a step farther by having the two invite members of the audience on stage for various purposes – one pair to illustrate the ideal couple, four people to participate in a basse danse with the cast. As the third servant, male actor Chris Tsujiuchi in drag as Joan is allowed to ad lib directly to the audience. Yet, even the characters of higher rank speak to audience as much as the other characters. Fulgens (Don Johanson) explains his decision to allow Lucres (Cassidy Sadler) to make her own decision directly to us. When Gaius (Austin Leggett) and Cornelius (Marlow Stainfield) plead their cases nominally to Lucres, they like orators also speak to us who have assembled to hear them. After each suitor has given his speech, Sergi has A and B ask the audience to show by its applause which one it thinks has won the debate. Sergi’s direction thus emphasizes that important side of early drama, interaction with the audience, that may be implied by the text but tends to lie hidden from readers of the text alone. If the servants are a bridge between the audience and the play, Sergi also uses them as a bridge between the present and the past. He therefore allows them a more modern gestural language than their masters. As A, Lauren Shepherd combines her helium voice with perfect comic timing with the result that she is often reminiscent of Curly of the Three Stooges. In contrast, to the earthy A, Catt Filippov as B is more of sprightly and bright, rather like Peter Pan. When dance music plays, the first instinct for both is the 21st century not the 15th. The hefty Chris Tsujiuchi, clad in headscarf and apron, is especially funny since he plays Joan as a big mama with attitude who punctuates his remarks with finger snaps and head turns. Pneuma may play medieval music, but Tsujiuchi is free to add a soul-like riff whenever he wants to. The servants’ masters may be models of seriousness but are still engaging. Don Johanson is the old Fulgens, but that doesn’t mean he can’t turn a cartwheel before his big introductory speech or dance with the same vigour as the others. Sergi gives Cassidy Sadler’s Lucres flowing, balletic arm movements to accompany her speeches either to illustrate how high above the others she is in virtue or to give her a way of physically demonstrating her grace. Austin Leggett is an ardent, earnest Gaius, whose performance makes us see him as the predecessor of all of Shakespeare’s ardent, earnest lovers. Marlow Stainfield is very funny as the vain Cornelius, obvious proud of his long locks that he shakes for emphasis and completely unaware that his egotism is what makes him a laughingstock. In imitation of the original setting, long tables are set up in the West Hall of University College in the form of a U with a separate high table for dignitaries behind the U. The performance space thus becomes the entire area enclosed by the U with the opening at the top for entrances and exits. To one side of that opening, there being no balcony in West Hall as there would have been in a typical Tudor hall, was situated the early music trio Pneuma, who provide vibrant accompaniment to the songs, dances and some speeches and play interludes between scenes. The group also contributes to the comedy of Cornelius’ speeches by playing fanfares on kazoos after each important point of his argument. Linda Phillips has created attractive costumes for the cast. The males wear gold-brocaded cream jerkins or doublets with maroon leggings, Lucrece a lovely flowing white gown and the drudge Joan a bright yellow shift. Phillips’ comic triumph is the finery that Cornelius changes into for the debate. This is all in flaming scarlet with a massive codpiece that is not the simple bulging triangle of cloth one might expect but rather a strap-on phallus of red velvet with gold trim. The codpiece both links Cornelius to the phallus-wearing satyrs of ancient comedy and reveals his true nature as a debauchee despite noble blood. Much humour derives from the superior attitude Stainfield affects as Cornelius despite the ridiculousness of his garb. For anyone with an interest in early English drama, Fulgens and Lucres is a must. There’s no use waiting for the Stratford Festival to do it. In 60 years it has not staged even one pre-Shakespearean English play. Even the PLS has not staged Fulgens and Lucres since 1973. But, more important, what this production so ably demonstrates is that an early play like this, when well directed, designed and performed, can appeal to anyone who loves the theatre. Not only is this Fulgens and Lucres a window into the past but a joyful feast of entertainment for the present. Photo: (from top) title page of an early edition of Fulgens and Lucres; Chris Tjujiuchi as Joan; Pneuma (Gavin Dianda, Eleanor Verrette and Tricia Postle). ©2014 PLS.